We present a number of student activities. Many more classroom activities may be found in our books. How do you create string art on a computer? In this lesson sequence, suitable for students at all levels of high school, we learn to create some beautiful designs based on practical principles using Geometry Expressions. Students apply graphic methods to design various shapes on the plane to create patterns similar to what stained glass artists create. Students investigate the effects of a generic function f(x) when translating it around the axes. 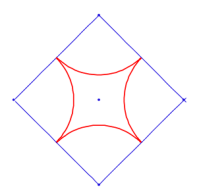 We use Geometry Expressions to calculate the radii of circles in a particular Pappus Chain. We will use inductive reasoning to conjecture a general form for this sequence of radii. We will then use mathematical induction to prove the formula for a general member of the Pappus Chain. 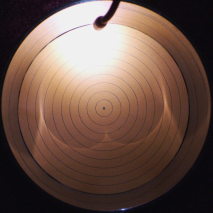 If you look at light reflected within a cylinder, you see a bright curve caused by the light being concentrated into a specific region. This curve is called a caustic. 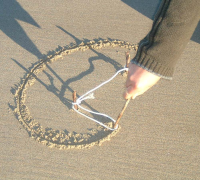 If you were on a Pacific beach and found a piece of old fishing net, and you unraveled some string from it, you'd find a couple of pieces of driftwood, tie the string to it and trace out an ellipse in the sand. Wouldn't you? Archimedes Trammel is a device consisting of a handle attached at two pivot points to sliders which can slide to and fro in perpendicular slots. 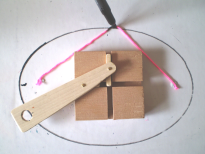 In this activity, we will investigate the curve formed by the trammel. Where should you take a conversion kick in Rugby in order to get the best angle on the goal? Investigate areas of some triangles.